Paramount, widescreen 1.85:1/16x9, languages: English DD 5.1 [CC] & Dolby Surround, French Dolby Surround, subtitles: English, single side-dual layer, 16 chapters, behind-the-scenes featurette, theatrical trailer, rated R, 105 min., $29.99, street date 2/22/2000. Directed by Bruce Beresford. Starring Tommy Lee Jones, Ashley Judd, Annabeth Gish, Bruce Greenwood, Roma Maffia, Davenia McFadden. Libby Parsons has it all – a handsome, wealthy husband whom she loves, a son they both adore, a beautiful home near Seattle, wonderful friends. But her idyllic life suddenly turns into a nightmare when her husband Nick (Bruce Greenwood) disappears overboard during a romantic weekend of sailing and she is accused of his murder. Convicted and imprisoned, Libby begs her best friend, Angie (Annabeth Gish), to adopt her 5-year-old son. Angie agrees and then vanishes with Matty. With the help of prison friends Margaret (Roma Maffia) and Evelyn (Davenia McFadden), Libby uses the telephone to trace them to San Francisco. There, she discovers to her horror, the two are living with Nick, who staged his own "murder" and has adopted a new identity. Margaret, a disbarred lawyer imprisoned for murdering her husband, pulls Libby back from despair with some comforting news: When Libby finally gets out, she'll be free to murder Nick – in the middle of Times Square if she wants – because she can't be tried twice for the same crime. That would be double jeopardy, and she's already been convicted of killing Nick. Six years later, Libby is discharged from prison into a halfway house and the care of Travis Lehman (Tommy Lee Jones), a cynical, burnt-out parole officer haunted by failures in his past. Lehman won't tolerate the slightest breach of the rules, but Libby almost immediately violates parole to track down her son Matty and Nick. Embarrassed by her escape, Lehman becomes as obsessed with finding Libby as she is with finding her son. What begins as a simple, albeit terrifying chase soon turns into an odyssey that changes his life as profoundly as it changes Libby's. Stop me if you've heard this before: person gets wrongly convicted of murder after spouse is killed, person escapes the clutches of The Man, and Tommy Lee Jones plays a law man who chases after this person. Sound familiar? No, not to me, either - it's a completely original plot! 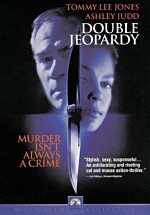 All sarcasm aside, Double Jeopardy has the pathetic distinction of being a rip-off of a film adaptation of a TV show. Amazingly, it manages to be even less original than US Marshals, the actual sequel to The Fugitive. Although DJ manages a few different plot twists, it still comes across as a virtual sequel to that hallmark thriller of 1993. In the unlikely event you don't know anything about these alterations from the earlier film, I'll leave them unreported, but suffice it to say that DJ sticks pretty close to the mold. In addition to the casting of incredibly uninspired casting of Jones in a role that neatly parallels his Sam Gerard in The Fugitive and its sequel (though he's somewhat less intense), DJ actually offers some scenes that very strongly echo some from the earlier film. For example, a New Orleans piece clearly steals from the St. Patrick's Day parade, and both films show daring water escapes. In a perverse way, I almost respect the filmmakers for casting Jones because it's such a ballsy move. Doing this so clearly sets up parallels with The Fugitive that it's absurd; it's like they were daring viewers to compare the two films. Of course, I suppose there could have been less provocative reasons for these moves; they might just have wanted to make a connection in hopes that moviegoers would grant their film goodwill based on past affection toward The Fugitive. Whatever the reason, it doesn't work, and DJ is a pretty bad piece of work. Oh, it's not unenjoyable. I felt little suspense because I could so easily predict what would happen. Hell, prediction wasn't even a factor most of the time; the film's trailer gives away three-fourths of the movie. (More about it later.) Still, the movie presents a few interesting moments, and the lead actors - Jones and Ashley Judd as our non-killer Libby Parsons - are likable, at least. However, Double Jeopardy presents one insurmountable flaw: it is easily one of the dumbest movies I've ever seen. "Dumb" doesn't necessarily mean "bad;" frequent readers of my reviews may recall the positive marks I've given to less-than-challenging works like Armageddon. However, that one was just "big, brainless explosion movie" dumb; DJ takes stupid to another level as it articulates some of the most asinine interpretations of the law and, well, life that I've witnessed. While I'm no lawyer, I'm pretty sure that the premise behind the film's title is hogwash. "Double jeopardy" refers to the law that one cannot stand trial more than once for a crime; this was placed in the Constitution to make sure that if you are acquitted once of an action, the prosecutors won't continue to retry it over and over until they get the desired conviction. However, the way this is interpreted in the movie states that because Libby has already been convicted of murdering her husband, if it turns out he's not dead, she can go ahead and kill him without fear of consequences (other than bloodstains on her clothes). Um... I don't think so, thank you! Really, if she were to shoot him at that point, it's a separate crime; she was convicted of a single incident and if she does it another time, it becomes a completely separate case. Look at it this way: if I rob the Wal-mart on Main Street and go to jail for that crime, does that mean I can do it again later? Hey, I've already served my time for holding up the Wal-mart on Main Street - can't go to jail for it again! The film itself offers many, many more implausibilities and just generally stupid actions and ideas. I need to go to bed in two hours, so I don't have time to list them all. Just suffice it to say that DJ never met a logical concept it didn't like. Just think: it was only a decade ago that director Bruce Beresford was on top of the world after he helmed Best Picture winner Driving Miss Daisy. Well, "on top of the world" may be an overstatement, since he received a rather dubious distinction at the time: DMD stands as one of the exceedingly few films to win Best Picture without a commensurate Best Director nomination. At least DJ brought Beresford back to the ranks of the commercially successful; I reviewed the other films he made over the last decade and hadn't even heard of most of them. Too bad he had to do so with such an idiotic movie. Double Jeopardy isn't the worst film ever made, but it's a stupid movie that never approaches a level higher than "mediocre rip-off." Double Jeopardy appears in its original theatrical aspect ratio of 2.35:1 on this single-sided, dual-layered DVD; the image has been enhanced for 16X9 televisions. While not without flaws, DJ presents a very typical example of the kind of quality I'd expect from a hit movie that's only four months old. Sharpness seems consistently terrific; at no point during the film did I note any hints of softness. Moiré effects are a periodic but generally minor intrusion, as are problems related to the anamorphic downconversion for my 4X3 TV; I saw more of those complications than I'd like, but they were never severe. (Judd's striped shirt does strobe pretty strongly, though.) Print quality appeared generally adequate but I saw more flaws than I'd expect; nicks and speckles crop up on occasion. These aren't severe, by any means, but such a fresh film really shouldn't display any of these defects. I noticed no grain or digital artifacts, though. Colors always seem very well-saturated and accurate with no signs bleeding or smearing; the scenes in New Orleans offer some especially lovely tones, with a wide variety of hues on display during those shots. Black levels looked deep and rich, and shadow detail seemed appropriate, though I thought the shots of Judd on the boat after she notices her husband's disappearance appeared a bit too dark. Overall, I may have found some problems, but the image looked quite solid. Also very good is the film's Dolby Digital 5.1 soundtrack. The soundfield seemed to favor the front but managed to display some good surround effects when warranted. I felt more ambient audio could have come from the rears, but I don't want to nit-pick; the sonic imagery seems very well-spaced and presents a good surround field. As with the colors, the New Orleans scenes offer the best examples of 5.1 sound; we really get a strongly involving track during those scenes. Audio quality appeared consistently very good. Dialogue always was crisp and clear and never lacked intelligibility. The score sounded deep and clean and presented itself with a strong dynamic range, and effects always appeared realistic and lacked distortion. Again, it's a very good track that represents the quality we'd expect from such recent, major studio movie. Double Jeopardy won't be confused for a special edition, but it does toss in a couple of supplements. The main one is a roughly thirteen and a half minute documentary about the film. Yes, it's a pretty standard promotional puff piece, but it's not a bad one. Best of all are some interesting "behind the scenes" shots and coverage of some of the stunts. It's not great, but it's worth a watch. Also included is the film's much reviled trailer. This clip has received an awful lot of flack because it falls into the camp of those that give away too much of the plot. While I agree that it does so, I feel somewhat sympathetic toward those who made it because they were put into a tight spot. In order to explain the film's title - and also to make it at least appear somewhat different from The Fugitive some plot twists had to be revealed. Does this negatively affect one's enjoyment of the film? Most definitely - I spent much of the movie thinking "get on with it!" because I knew certain events had to occur. Nonetheless, I think much of this was virtually unavoidable; sometimes it's really hard to sell a movie without revealing too much, especially if that film is a thriller. Since the trailer got fannies in the seats, I guess it succeeded, but the same cannot be said for this absurdly dumb film. Double Jeopardy largely lacks suspense, thrills or excitement and it actually may have killed some of my brain cells. Paramount did a pretty nice job with the DVD, although additional supplements would have been nice. Nonetheless, the movie isn't worth watching. Skip it and pop in The Fugitive again; even if you've seen it five times it's as suspenseful as DJ and it's much better made.